January 1, 2017 AB-1785 becomes effective in California. Under the new law drivers will no longer be allowed to hold their cell phones in their hands for any reason, including using any of a phone’s apps, such as music playlists or maps. Under the new law, drivers can still use their cell phones if they do it hands-free, which often means voice activated and operated. The law says cell phones can be mounted in two spots on the windshield: either a 7-inch square in the lower corner of the windshield on the passenger side, or a 5-inch square in the lower corner of the windshield to the driver’s left. 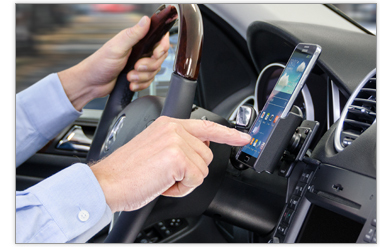 Drivers can also attach the phone holder to the dashboard in a spot where it doesn’t block the drivers’ view of the road or get in the way of airbags.